Constructed of the finest materials and packaged into convenient economy priced sets, Chapman Tools are a must for anyone who deals with small to medium size screws, bolts and nuts. For assembly or disassembly these miniature ratchet sets pay for themselves in the hours saved and offer unsurpassed versatility and speed. 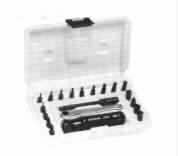 To insure the proper tool for the job, Newman Tools offers a selection of 9 kits plus a wide range of open stock. 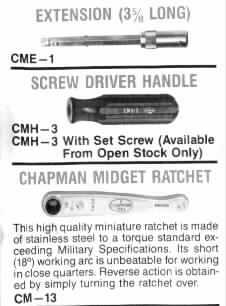 This high quality, miniature ratchet is the heart of each Chapman Kit. Originally designed for industry, it is now available to every craftsman. The Chapman twenty tooth ratchet is made of stainless steel and has a strength which far exceeds the torque standards set by Military Specifications. Having a short ,18° working arc, it is unbeatable for working in close quarters. Dependable and fast acting, it easily drives Phillips, Allen Hex type, Reed and Prince, or Bristol (Multi-Spline) screws. Used with the 1/4" square drive adapter, it also accommodates 1/4" square drive sockets. Reverse action is obtained by simply turning the ratchet over. 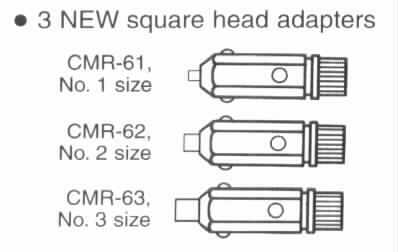 Recently improved with lower 'ears' and a set screw, the CME-1 extension has been changed for greater stability, or it can be used alone with either the CM-13 ratchet or the CMH-3 screwdriver handle. Extensions can also be stacked together for more length. The CMS-3 adapter is used to tighten the set screw to lock an adapter or another extension into the extension. Chapman versatile adapters are constructed of the highest quality Chrome Nickel Molybdenum Alloy Steel and precision made to insure a proper fit. 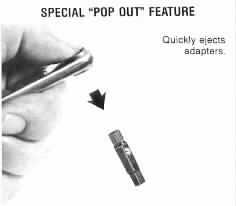 Their dual-purpose, knurled "Spinner Tops" allow for quick finger tightening of threads and for instant "push down" removal of the adapter from the ratchet. Ball-detents plus stops quickly position and secure each adapter in either the handle or extension. The above sets are packaged in a brilliant yellow, oil and crush resistant, blow moulded, polyethylene case with each part nesting in its own individual compartment.